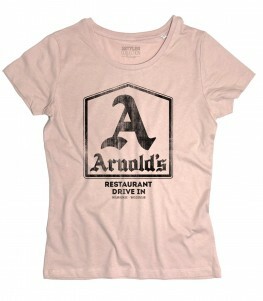 Boss Hogg t-shirt – T-shirt bambino ispirata a Jefferson Davis Hogg il “cattivo” della serie Hazzard. Commissario della contea di Hazzard è invischiato in una marea di affari illeciti. Scorretto e corrotto, passa la vita a cercar di far finire in galera i fratelli Dukes, Bo e Luke, che spesso ostacolano i suoi affari, ma fallisce sempre miseramente. 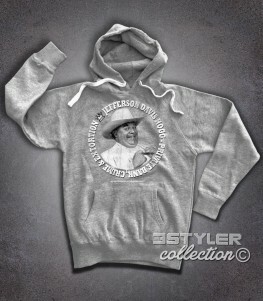 Sempre vestito di bianco, con una cappello da cowboy in testa, gira in Cadillac con i suoi stivali di pelle bianca. Quando non fa inseguire i Duke le sue attività preferite sono: fumare sigari esplendidos da 29 cm, magiare coscette di pollo fritte, contare i soldi e insultare lo sceriffo Rosco. 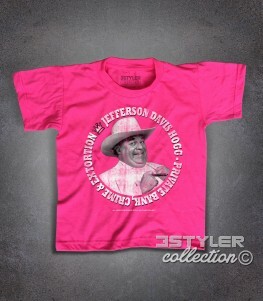 Boss Hogg t-shirt – Kids t-shirt inspired by Jefferson Davis Hogg the “bad” of Hazzard series. 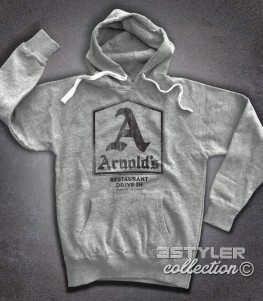 Hazzard’s County Commissioner is embroiled in a tide of illegal business. Unfair and corrupt, spends his life trying to go to jail the Dukes brothers, Bo and Luke, which often hamper his business, but always fails miserably. 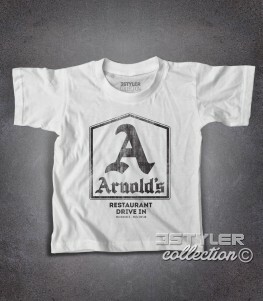 Always dressed in white, with a cowboy hat on his head, turns in Cadillac with its white leather boots. When not chasing Duke her favorite activities are: smoking cigars Esplendidos 29 cm, eat drumsticks fried chicken, count money and insult the sheriff Rosco. 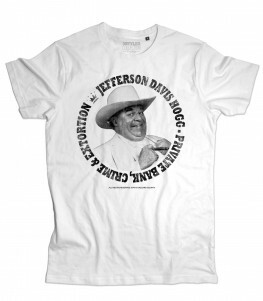 Boss Hogg t-shirt – T-shirt uomo ispirata a Jefferson Davis Hogg il “cattivo” della serie Hazzard. Commissario della contea di Hazzard è invischiato in una marea di affari illeciti. Scorretto e corrotto, passa la vita a cercar di far finire in galera i fratelli Dukes, Bo e Luke, che spesso ostacolano i suoi affari, ma fallisce sempre miseramente. 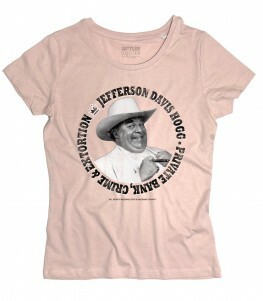 Boss Hogg t-shirt – Men’s t-shirt inspired by Jefferson Davis Hogg the “bad” of Hazzard series. 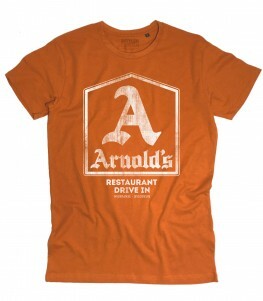 Hazzard’s County Commissioner is embroiled in a tide of illegal business. Unfair and corrupt, spends his life trying to go to jail the Dukes brothers, Bo and Luke, which often hamper his business, but always fails miserably. 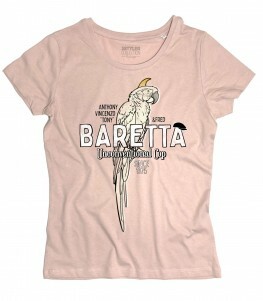 Charisma label t-shirt bambino – T-shirt ispirata alla Charisma Records, famosa casa discografica fondata da Tony Stratton-Smith nel 1969. Il logo della Charisma label era un’illustrazione realizzata da John Tenniel raffigurante il Cappellaio Matto di Alice nel Paese delle Meraviglie. Tra gli artisti che incisero con la Charisma label ricordiamo Alan Parson, i Genesis, Peter Gabriel e i Monty Python. 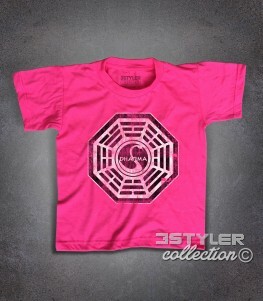 Charisma label kids t-shirt – T-shirt inspired by Charisma Records, famous record company founded by Tony Stratton-Smith in 1969. 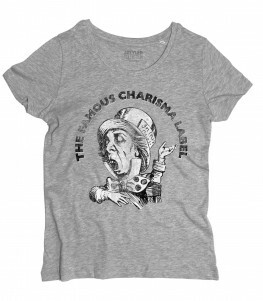 The Charisma label logo was created by John Tenniel and depicts the Mad Hatter of Alice in Wonderland. Among the artists who engraved with the Charisma label include Alan Parsons, Genesis, Peter Gabriel, and Monty Python. 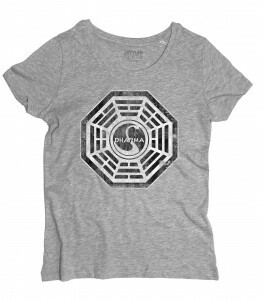 Charisma label t-shirt donna – T-shirt ispirata alla Charisma Records, famosa casa discografica fondata da Tony Stratton-Smith nel 1969. Il logo della Charisma label era un’illustrazione realizzata da John Tenniel raffigurante il Cappellaio Matto di Alice nel Paese delle Meraviglie. Tra gli artisti che incisero con la Charisma label ricordiamo Alan Parson, i Genesis, Peter Gabriel e i Monty Python. 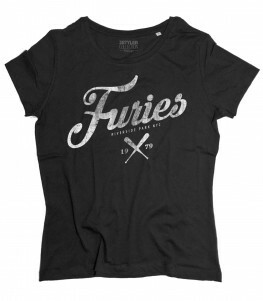 Charisma label women’s t-shirt – T-shirt inspired by Charisma Records, famous record company founded by Tony Stratton-Smith in 1969. The Charisma label logo was created by John Tenniel and depicts the Mad Hatter of Alice in Wonderland. Among the artists who engraved with the Charisma label include Alan Parsons, Genesis, Peter Gabriel, and Monty Python. 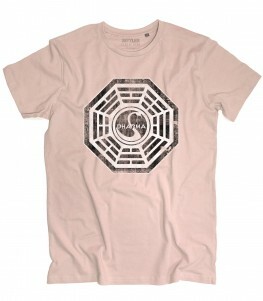 Charisma label t-shirt – T-shirt uomo ispirata alla Charisma Records, famosa casa discografica fondata da Tony Stratton-Smith nel 1969. Il logo della Charisma label era un’illustrazione realizzata da John Tenniel raffigurante il Cappellaio Matto di Alice nel Paese delle Meraviglie. Tra gli artisti che incisero con la Charisma label ricordiamo Alan Parson, i Genesis, Peter Gabriel e i Monty Python. 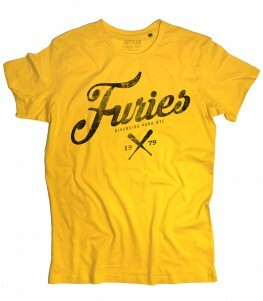 Charisma label men’s t-shirt – T-shirt inspired by Charisma Records, famous record company founded by Tony Stratton-Smith in 1969. 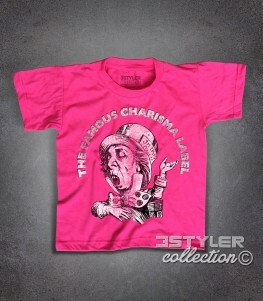 The Charisma label logo was created by John Tenniel and depicts the Mad Hatter of Alice in Wonderland. Among the artists who engraved with the Charisma label include Alan Parsons, Genesis, Peter Gabriel, and Monty Python. 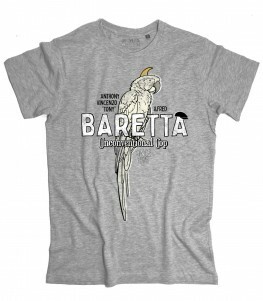 Elvis t-shirt bambino – T-shirt raffigurante i famosi occhiali di Elvis dorati e la scritta “Elvis has left the building”. Questa frase veniva pronunciata alla fine dei concerti di Elvis dallo speaker Al Dvorin al fine di convincere i fan del re ad andarsene. Il concerto è finito, potete andare a casa, ormai il Re ha lasciato l’edificio. Incontrastato Re del Rock Elvis suscita ammirazione e totale devozione ancora oggi, a 34 anni dalla sua morte, tanto che la sua dimora, Graceland a Memphis, è la seconda residenza più famosa e visitata degli Stati Uniti dopo la Casa Bianca. Rivoluzionario, eccessivo ed eccezionalmente bello, la sua presenza scenica e il suo talento musicale hanno avuto un impatto senza precedenti sulla cultura e mondiale. 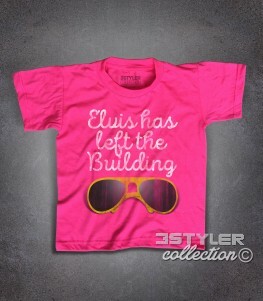 Elvis kids t-shirt – T-shirt depicting the famous gold Elvis glasses and the words “Elvis has left the building.” This sentence was pronounced at the end of the concerts of Elvis by the speaker Al Dvorin to convince fans of the king to leave. The concert is over, you can go home, the King has left the building. Undisputed King of Rock, Elvis inspires admiration and total devotion to this day, 34 years after his death, so that his home, Graceland in Memphis, is the second most famous resident and visited the United States after the White House. Revolutionary, excessive and exceptionally beautiful, her stage presence and his musical talents have had an unprecedented impact on the culture and world. 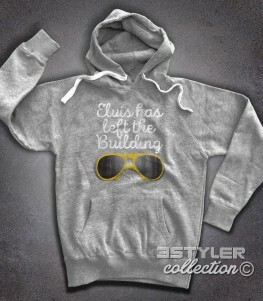 Elvis t-shirt – T-shirt donna raffigurante i famosi occhiali di Elvis dorati e la scritta “Elvis has left the building”. Questa frase veniva pronunciata alla fine dei concerti di Elvis dallo speaker Al Dvorin al fine di convincere i fan del re ad andarsene. Il concerto è finito, potete andare a casa, ormai il Re ha lasciato l’edificio. 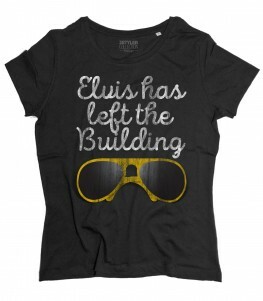 Elvis t-shirt – T-shirt uomo raffigurante i famosi occhiali di Elvis dorati e la scritta “Elvis has left the building”. Questa frase veniva pronunciata alla fine dei concerti di Elvis dallo speaker Al Dvorin al fine di convincere i fan del re ad andarsene. Il concerto è finito, potete andare a casa, ormai il Re ha lasciato l’edificio. 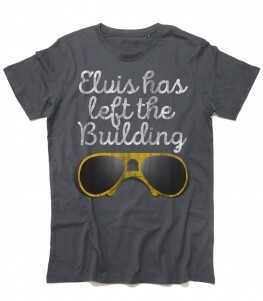 Elvis t-shirt – Men’s t-shirt depicting the famous gold Elvis glasses and the words “Elvis has left the building.” This sentence was pronounced at the end of the concerts of Elvis by the speaker Al Dvorin to convince fans of the king to leave. The concert is over, you can go home, now the King has left the building. 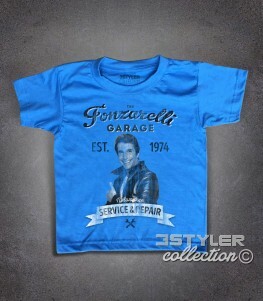 Fonzie t-shirt bambino – T-shirt ispirata ad Arthur Herbert Fonzarelli, soprannominato Fonzie (The Fonz in lingua originale) superstar del felice telefilm Happy Days. Fonzie, giovane meccanico spiantato, è il “beccio” per antonomasia. Possiede tutte le caratteristiche che doveva avere un ragazzo “figo” all’epoca in cui è ambientato il telefilm, gli anni 50/60: giacca di pelle nera e ciuffo durissimo alla James Dean, pantaloni attillati col risvolto, atteggiamento da sbandato ma non troppo, motocicletta possibilmente Triumph, esperto con le ragazze e prepotente ma paterno con i “pivelli”. 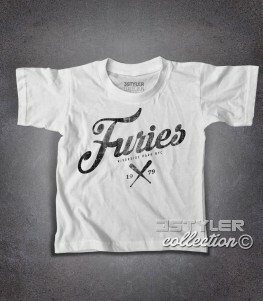 The Fonz t-shirt – Kids t-shirt inspired by Arthur Herbert Fonzarelli, nicknamed The Fonz, superstar fun show Happy Days. Fonzie, penniless young mechanic, has all the features you must have had a boy “cool” at the time when the show is set, ie the years 50/60: black leather jacket and tuft hard to James Dean, tight pants with flap, attitude drifter but not too much, possibly Triumph motorcycle, an expert with the girls and overbearing but at the same paternal time with “rookies”.